Finally, I bring you my second part of my Mega Fall Haul. Yiha!! Yiha!! New shopping obsession, please. If you haven't read my first post: Fall Haul (I), run, run and read it! I warn you, if you are that kind of person that when read a Haul want to buy it all, maybe your credit card is in danger. I also have a good new, this Mega Fall Haul will have a third (and my economy hopes a third and last) post because a week ago I ordered a super purchase of korean cosmetics in the website Jolse, and I say “super” because it was an order made by my sister and I with 9/10 products. I lived in South Korea for a year so I will be very happy to tell you a bit about korean skincare and curiosities. Por fín, os traigo la segunda parte del Mega Haul de Otoño/Invierno. ¡Yihaaaaaaaa! Nuevas obsesiones, por favor. Si aún no has leído mi primer post: Fall Haul (I), ¡corre a leerlo! Te lo advierto, si eres de ese tipo de personas que cuando leen un Haul quieren comprarlo todo, puede que tu tarjeta de crédito esté en un serio peligro. También tengo una buena noticia, este Mega Fall Haul tendrá una tercera parte (y espero que tercera y última por el bien de mi economía) ya que hace unas semanas he realizado un súper pedido a la web de cosmética coreana Jolse, y digo súper porque ha sido un pedido entre mi hermana y yo por lo que nos tienen que venir unos 9/10 productos nuevos. Viví en Corea del Sur durante un año así que me va a encantar hablarte un poco sobre cosmética coreana y curiosidades. So, let’s stop speaking (or writing) and here are my NEW stuffs. 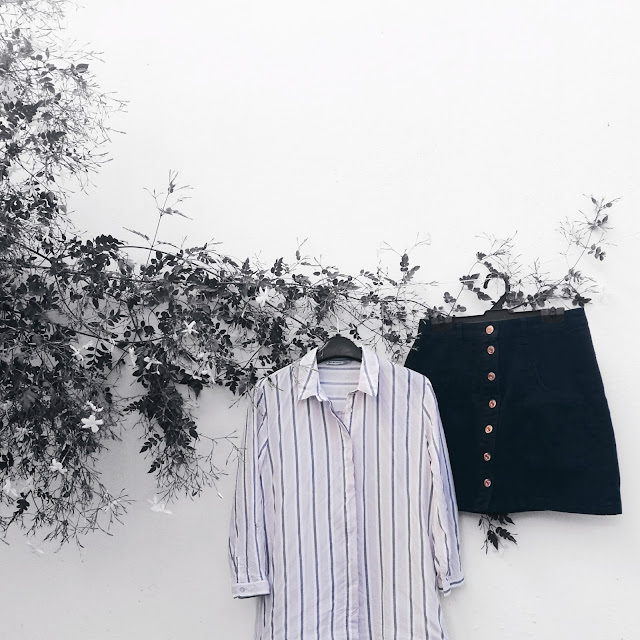 Stradivarius: You probably have seen some of my Stradivarius new clothes on my Instagram because I went inside the store and I loved everything and I couldn’t wait to wear most of them. 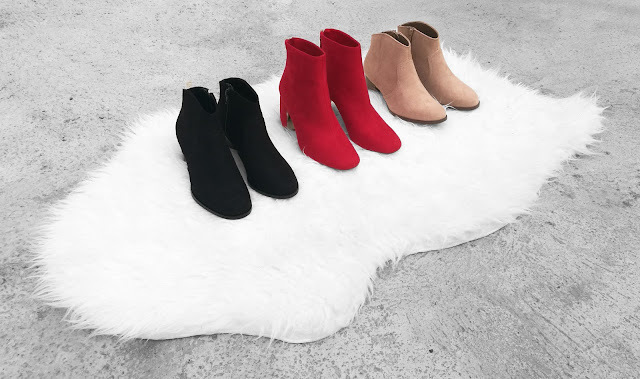 Red ankle boots. 25,95 €. One of my obsession this season. I didn’t wear it yet, because in South Spain it is tooooo hot now, and yes, we are at the end of October, but I’m looking foward to wear it with everything. Black skirt with buttons. 17,65 € I have a very similar denim skirt, also from Stradivarius, but I wanted a darker one for this Fall because I use to wear the denim on Summer. Striped shirt with ¾ length sleeves. 12,95 € You can get this awesome shirt, perfect to work, with a really low price. I wear it on the first pic of this post and its ¾ length sleeves make it optimal to wear in Autumn or Spring. Stradivarius: Probablemente hayas visto algunas de estas prendas en mi Instagram porque claro está, entré en la tienda y me gustó todo y no he podido esperar nada a ponermelo. Botines rojos. 25,95 €. Una de mis obsesiones para esta temporada. Aún no me las he puesto porque en Andalucía hace mucha calor, y sí, sé que estamos a finales de Octubre, pero estoy deseando poder llevarlas. Falda abotonada negra. 17,65 €. Tengo una muy parecida vaquera, también de Stradivarius, pero quería una más oscura para llevar en Invierno ya que la vaquera la uso más en verano. 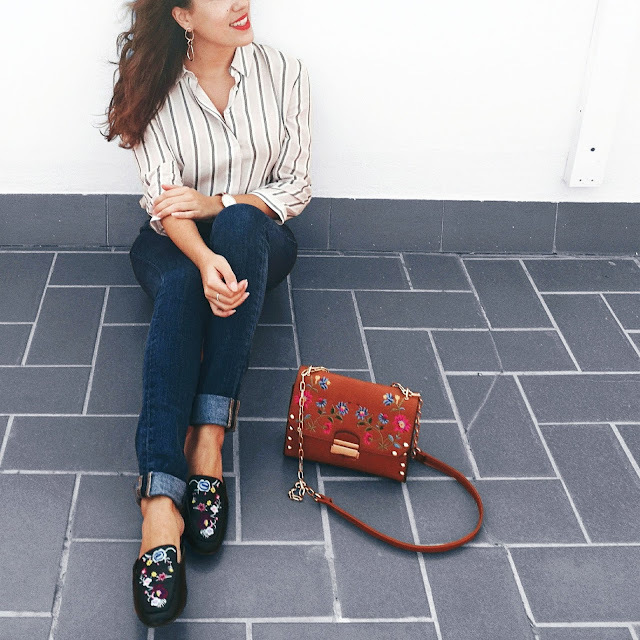 Camisa de rayas con manga ¾. 12,95 €. La verdad que una camisa como ésta, perfecta para el trabajo, y a precio tan reducido merece comprarla. La llevo puesta en la foto que ilustra el post y tengo que decir que la longitud de la manga es ideal para Otoño o Primavera. H&M: I had an special discount (2x1) for being part of H&M Club so I decided it was the best time to buy basic ankle boot to wear everyday. sería el mejor momento para comprar botines básicos para llevar todos los días. Kiko Milano Cosmetics: Me and make up, another love story. Gossamer Emotion Creamy Lipstick. 6,95 € Last year, I bought this lipstick for the first time. I was looking for a dark red for Autumn and I found the perfect one on 2016 Autumn collection. I can’t tell you the number because it is not on the packaging… I love how soft and creamy it is so this season I bought a new color, number 114. 3. 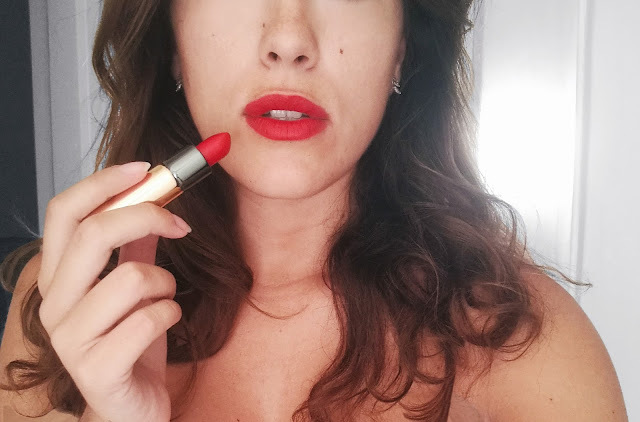 Kiko Milano Cosméticos: Yo y el maquillaje, otra historia de amor. 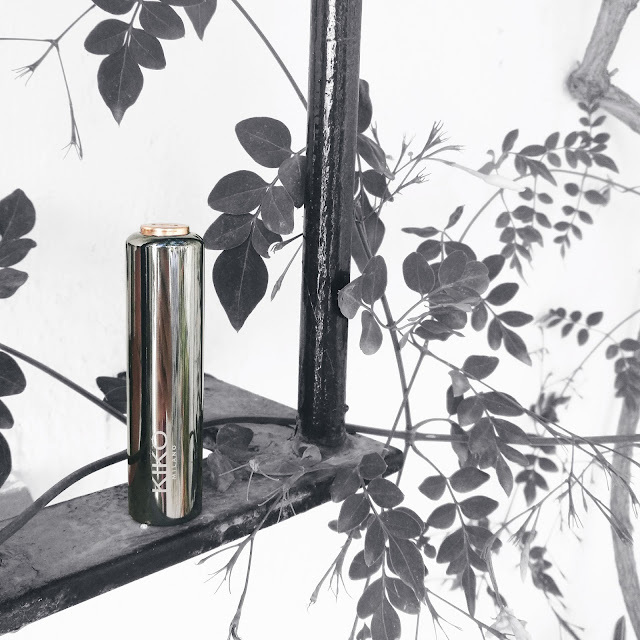 Barra de labios Gossamer Emotion Creamy. 6,95 €. El año pasado, compré esta barra de labios por primera vez. Estaba buscando un rojo bastante oscuro para el Otoño y encontré el color ideal en la colección de 2016. No sabría decirte el número porque no viene en la barra… Lo que sí que me encantó fue lo suave y cremosa que era, tanto que esta vez he vuelto a comprarla de otro color, el número 114. Choker neck blouse with puffy sleeves. 15,99 € I love its choker neck and of course its khaki color, a must have for Autumn. Fluffy sweater with puffy sleeves. 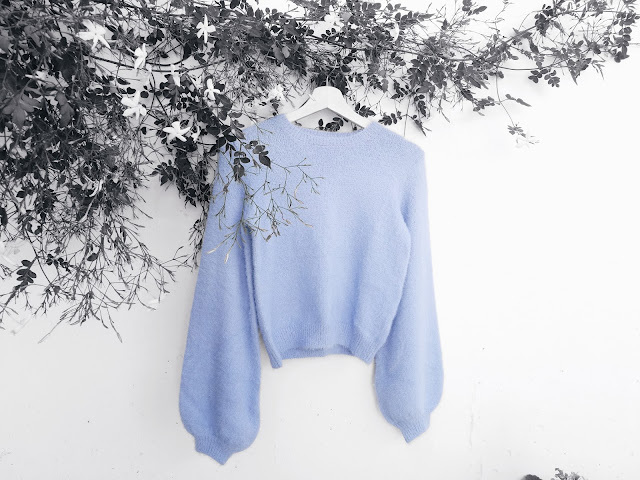 17,99 € It is the softer sweater ever! Blusa cuello choker manga abullonada. 15,99 €. 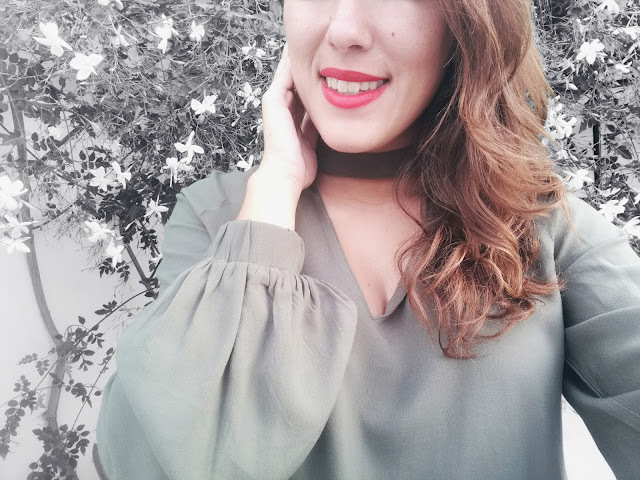 Me gustó sobre todo el cuello chocker y, por supuesto, su color caqui es ideal para Otoño. Jersey fluffy con manga abullonada. 17,99 € ¡Es el jersey más suave que he visto nunca! 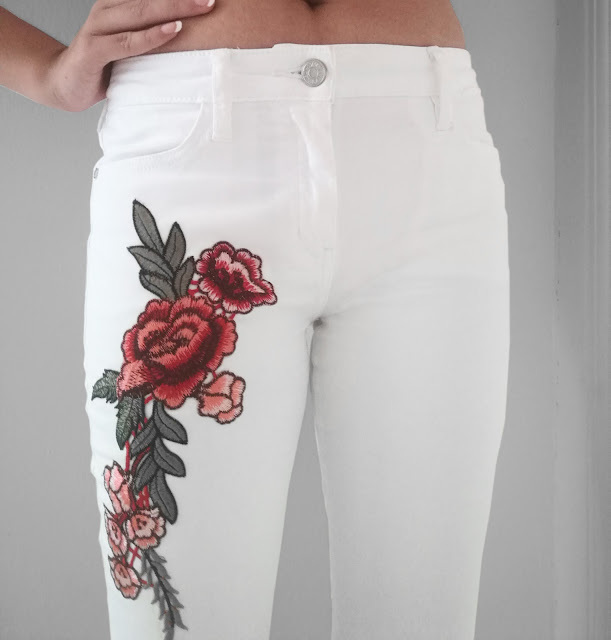 Skinny embroidered white jeans. 19,99 € I’m in love with this embroidered detail! Awesome roses. Its price was 35,99 € but now you can buy it for just 19,99 € so you can imagine my face on the store when I saw it. Please, don’t show me new pieces because I bought soooo much hehe. I’m going to be far, far, faaaar from stores for a while. Did you like it? What is your favourite item? 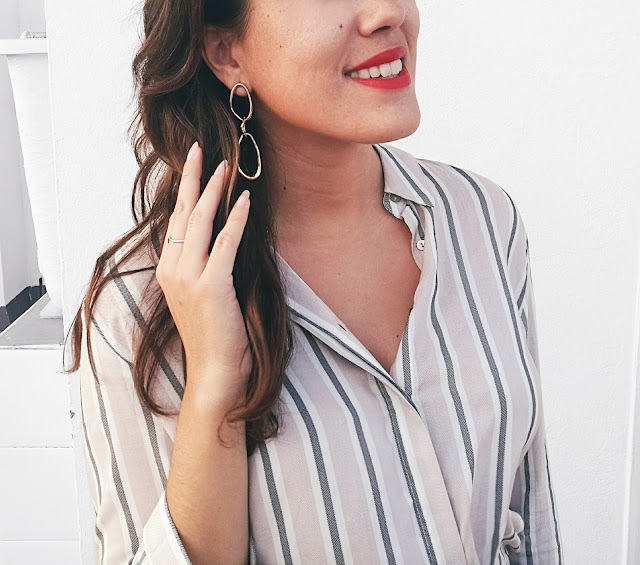 Pendientes de aros entrelazados. 7,99 €. Increíbles piezas de arte de tono dorado. Vaqueros blancos bordados. 19,99 €. 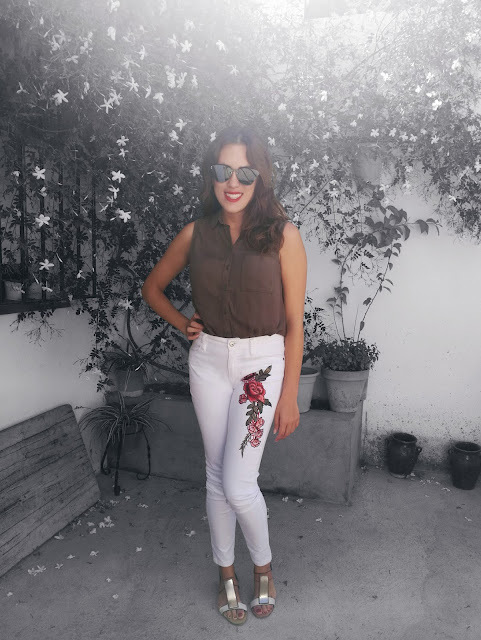 ¡Me encanta su detalle bordado de rosas| Su precio era de 35,99 € pero ahora puedes conseguirlo por solo 19,99 € así que imaginate mi cara cuando lo ví en la tienda. Por favor, no me enseñes nada nuevo porque ya he comprado demasiado jajaja. Voy a estar alejada de las tiendas por una temporada, en serio. ¿Te han gustado mis novedades? ¿Cuál es tu favorita? Thank you so much! This sweater is soooo soft. Wow now I understand what you said on my blog. You've picked some great and stylish ensemble. I love it and can't wait to see how you style em all. You look wonderful too. hehehe you understand me! I've bought so much clothes this two months. hehe I really want to do travel post on the blog like... "Places I've visited" or something like that but I need more time. I think with South Korea it couldn't be enought with a single post, it is an awesome and different place. Thank you soooo much pretty! So many great pieces, I have serious shoe envy. I love Stradivarius but they do not have it where I live. Thank you so much! I loooove Stradivarius, it has awesome clothes with cheap prices. You have an amazing Instagram babe, I follow you too. I will take a look to your post about the IG Challenge. Looks like you had lots of neat purchases lately! Kiko Milano is beoming a bigger brand name than ever. Love all of the clothing items you purchased :). hehe yes!! Too much purchases during September and October. these are such great picks! loving the red boots and I'm dying to try more of Kiko's products. They look so good! Thank you so much babe! I love all Kiko products, I use to buy lipsticks and nail polish, they are the best. Genial selección, me encanta todo! Los pantalones bordados son geniales!! Thank you so much! Red boots are everything. I love the striped shirt and those boots! So cute! I always found it extremely brave for woman to rock white pants, considering some unpredictable circumstances, and I love those. They're so cute. I also love the sweater. Looks perfect to dress up or down! I just have this pair of white pants but they are perfect with a blouse. hahaha poor credit cards! We over-use them. I am happy you like it!